The Kubota RTV 500 and RTV 400 are the smallest in the Kubota line of RTVs however that doesn't mean it doesn't pack a punch. The RTV 500 and 400 feels right at home hauling loads around the farm and taking you into the woods for a hunt. 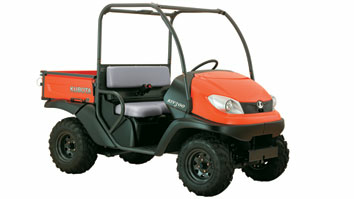 Here at Side By Side sports we offer a full line of Kubota RTV 500 parts and accessories that compliment the hardworking character of this machine. We offer Kubota RTV 400|500 Windshields, Kubota RTV 400|500 Roofs, Kubota RTV 400|500 mirrors, Kubota RTV 400|500 winches and much much more.